A round-up of all improvements and changes to the Buzz platform in version 2.0.72, available on October 13, 2016. 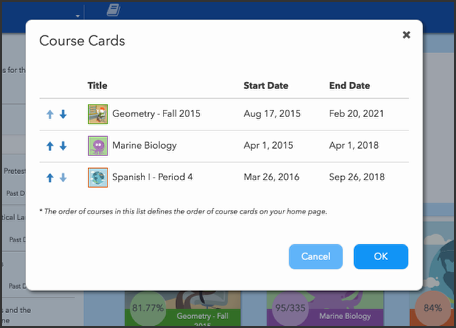 Students can now control the order in which their Course Cards appear on their Home page! How do I reorder my Course Cards? Admins can now create metadata fields that appear in User Profiles using Domain Settings > User Options. 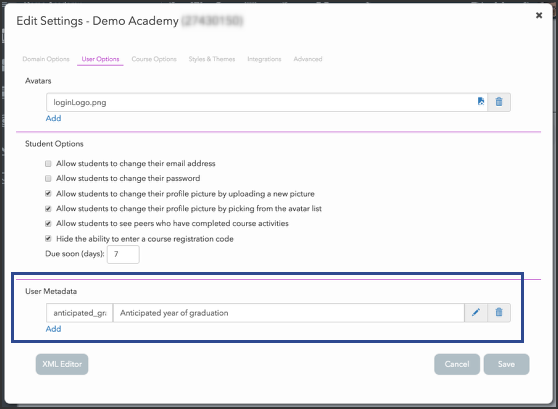 Added attach course link functionality to messages and tasks when all recipients are part of the same course. Added the option to preview linked questions and question banks when in the process of linking them. Changed the linked passage indicator field from an entry box to a dropdown that allows users to easily indicate which passage they want attached to the question. Updated assessmet rich text editor to automatically add images as course resources when they're added to the assessment, allowing users to make edits later. Updated Manage Resources preview functionality to inform users when a file cannot be previewed in Buzz and to give them the option of downloading it. Updated the Activity Grader to highlight the row currently being edited. Added column headers where necessary for screen readers. Made many updates to the Teacher and Admin apps to improve accessibility for users with a visual impairment. While many of the updates were under-the-hood, users may notice improved keyboard navigation throughout multiple tools and slight style changes to selected and focussed buttons and menu options. Fixed item data merging issues related to deleting and restoring master and derivative activities. Fixed an issue that caused confirmation dialogs to appear behind the activity editor when you're switching groups. Fixed an issue that kept metadata fields from updating without the manually refreshing the page. Removed the Stop Accepting Submissions button from the Gradebook for continuous courses because it assigns a due date. Removed unnecessary (and error-causing) grouping options from the Gradebook tab of the Peer Assessment activity editor. Updated the Assessment question editor to wait until all questions are loaded before giving users the Preview and Edit all buttons. Fixed an issue that asked users to confirm that they wanted to leave the page when attempting to download a resource file from Manage Resources. [IE 11] Fixed an issue that caused the IE 11 to crash when a user clicked Show List in the Select Resource dialog. Fixed the ability to insert images into assessment questions. Removed case sensitivity from Manage Resources to resolve folder tree display issues. Updated File Notes, so that it never appears as though users with read-only rights can make edits. Fixed an issue that caused discussion posts to reject attachments with filenames using special characters. Added an error message to the Activity Grader that is displayed for an activity in a Mutli-Outcome Scoring course when the user hasn't set up points possible for at least one scoring objective. The message is similar to one that already appears in the single-student Grade Editor screen for that activity. Updated Multi-Outcome Scoring courses to display a single score-entry box for editing the computed score when opening the Batch Update grading dialog for auto-graded activity types. The computed score is automatically applied to the activities' Mutli-Outcome Scoring objectives. Updated item history functionality to record score changes made to activities in Multi-Outcome Scoring courses. Fixed an issue that rollup scores to fail to display for a teacher in Multi-Outcome Courses if there was data for an objective that is no longer aligned to the course. [Windows and Chrome] Fixed an issue that caused the header on resources to wrap when viewed on small screens. Fixed an issue that wouldn't allow students to submit an activity during the designated grace period when the Automatically assign zero scores to past-due activities option was selected. Updated the functionality of the Assign zero scores automatically to content past the due date setting in BrainHoney to mimic the behavior of the Automatically assign zero scores to past-due activities setting from Buzz when a user sets it in the Buzz Editor and saves. The Buzz behavior sets the student's score to 0 when it's due, but before the grace period (if any) expires, helping to motivate the student to submit during the grace period; the BrainHoney behavior sets the student's score to 0 only after the grace period expires. Removed Mark this activity complete options that were incorrectly included in Blog and Journal activities.